Over the last few years, there has been an explosion of new tools and websites targeted towards making life easier for freelancers, start-ups, and entrepreneurs. With so many out there, it can be difficult to know which ones to spend time on. After all, if you used them all, you’d spend your life managing your online life. Not ideal when you’re trying to develop and grow your business. To make things easier for you, I’ve pulled together a list. Obviously. Who doesn’t love a list? SIX WEBSITES I COULDN’T LIVE WITHOUT. No matter the size of your company, social media matters. It can be tough to keep on top of a regular posting schedule, especially if you have a variety of accounts or are lucky enough to travel a lot. Simply link your accounts (Facebook, LinkedIn, Twitter, Google+ etc) and then line up your content. It’ll post them automatically throughout the day, whether you’re logged on or not. Even the basic (free) account has a decent level of link analytics to show you what content resonates with your audience and when. I’ve combined my Buffer account with Quuu; an app that helps you find interesting content on a range of topics – from AdWords to Yoga. This means that even if I’m not actively posting on my social media accounts personally, I am still regularly sharing highly relevant (and shareable) content. Let’s face it, although Adobe is amazing, getting the full-blown version of Acrobat is expensive. Luckily, I have an answer. Smallpdf, a website developed in Switzerland (hoorah to Swiss ingenuity! ), is free and does pretty much everything you might need.Conversions, merging, splitting, unlocking and protecting. The free version allows you to upload and modify two files an hour – more than enough for any burgeoning business. Why is it that some people seem able to create beautiful images to go with their content? How can they afford to keep a designer on tap? Where did they learn their skills? The free version allows you to work from templates and design anything from a Pinterest image to an infographic to your CV. It’s intuitive, even for those of us not design-inclined, and has pretty much everything you need to make great images – fonts, icons, images, and layouts. You have no excuse now! Finding images that a) don’t look like every other stock photo in the world and b) have licences accessible to freelancers and startups has just got a lot easier. Step forward FreeImages.com (formally sxc.hu). Free to register, free to browse, and free to download. With over 300,000 images, with a little bit of searching (think of it as the TK Maxx of the stock photo world!) you’re bound to find the thing you’re looking for. Remember to double-check the licence restrictions. LinkedIn? Really? LinkedIn? That boring website where old people go to find jobs? Yes, LinkedIn. It’s changed. Not only has it been bought for a cool $26.2b (resulting in its share price jumping by over 40%) but LinkedIn has actually become… well, useful. For me, one of the most useful features is LinkedIn Pulse. A never-ending reading list of opinion, conjecture, and analysis from professionals across the world. Fancy reading about capitalism? Why not read a post by the CEO and Editor of Business Insider? How about finding out what Bob Collymore (CEO of Safaricom) thinks about the secret to success? I love Hubspot. A lot. I love that they offer an easy-to-use (free! )customer relationship management system (if you don’t have a CRM yet, Hubspot is well worth a punt). From a communications point of view, I love the way they talk about themselves and what they stand for. So? What have I missed? Do you have a favourite website (or websites!) that I’ve missed? Share them by emailing me, tweeting me, or leaving a note in the comments. Imogen Hitchcock is the head of Beaumont, a partner company of Racosch that specialises in helping companies tell their story effectively through message development and content creation…. 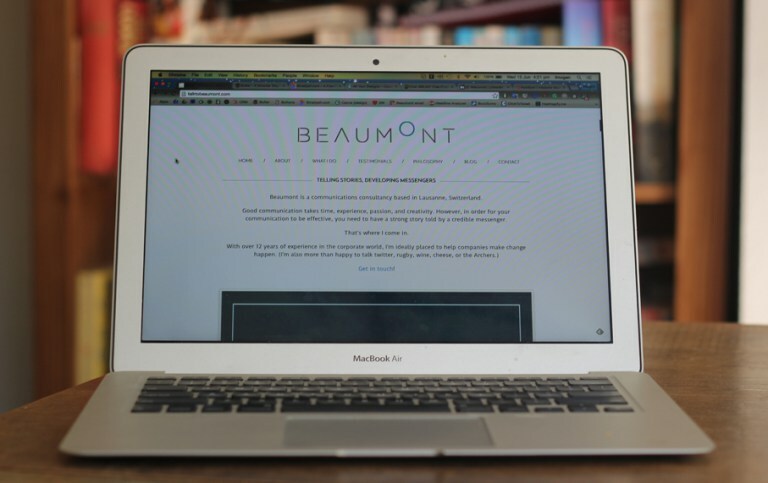 Find out more about Imogen and her company at talktobeaumont.com.